Just steps from Little Tokyo running from 3rd to 5th street off of S. Central Ave lies a neighborhood once known for being a thriving seafood distribution hub in the 1920s. The North Sea District, sprawling roughly across 200 acres of the Los Angeles Industrial District, was once live with burgeoning seafood businesses catering to grocery stores and restaurants spanning the city. Unlikely specialties such as cross-pacific imports and commercial fishing are what made this stretch of land into a small maritime mecca nearly a century ago. Unfortunately, in the 1970s, the times shifted and the neighborhood declined. However, during this time, many of these businesses remained behind actual lock and key, and they still operate today. In 2017, residents of the existing businesses came together with neighborhood devotees to push forward a self-funded beautification program that splashed the block with colorful, artistic influence -- and you guessed it, more seafood. The North Sea resides today as a homage to the past, as well an ode to the ever-evolving artistic influence that has reinvented this nautical district. As the tides changed, Brandon and Flynn wanted something more out of their creative space. Brandon has a trained background in beer and wine, with additional experience as a bartender, talent booker, and live sound engineer. Flynn, on the other hand, is the curator and designer for the space, and has worked as a master glassblower for 18 years. While teaching and fine-tuning his craft, Flynn also traveled around the world until the Malibu native returned to his roots in sunny California. That’s when a long-time friend of his offered Flynn the space, and the rest is history. When it comes down to design, the only way you could walk into High Tide without some sort of smirk on your face is if you didn’t have a face. 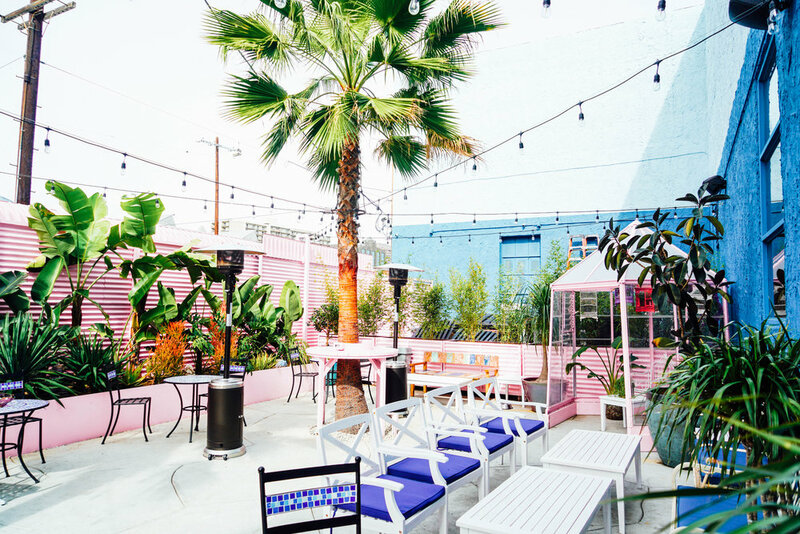 Complimentary pinks, purples, and blues re-occur throughout the space with a mural by Stacey Smith presented as their centerpiece. Upon stepping onto the patio you’ll find Flynn’s glassblowing studio where you can witness the magic in action as he works in a semi-open space. Cozy seating areas including a “Birdhouse” for patrons to sip and enjoy the company of the afternoon or evening are spread out with ease, encouraging guests to kick back and stay a while. With a vast selection of wines handpicked by Brandon and his long-time friend Graham Bockmiller, who also happens to be High Tide’s booking/talent agent, with the wine list in particular, an underlying theme occurs, and the proof is in the pink. You know, pink walls, pink flamingos, pink wines. The craft brews on the other hand, well there’s a method to that too. 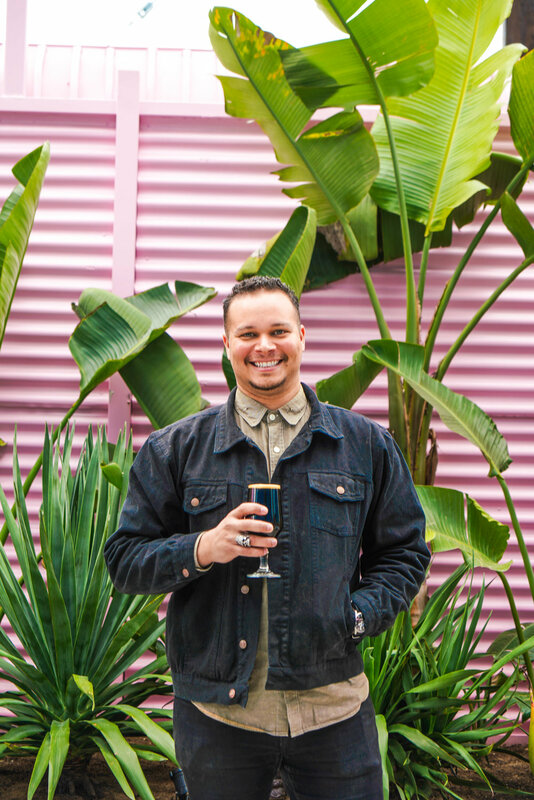 “For the beer menu, what I wanted to do was go hyperlocal with it, so most of it comes from east LA. Out of our 16 taps, all but 4 of them are made in East LA.” says Brandon. “We have every major Downtown Los Angeles Brewery, everything from Pasadena, to Eagle Rock, and Highland Park -- so basically every craft brewery in east LA, we’re carrying.” Brandon mentioned that the four beers on draft that aren’t local however, each have a backstory as to why they made the list. “Artifacts brewing, which is made down in San Clemente, those are guys I actually went to high school with,” says Brandon. “So I made Flynn try their beer years and years ago -- it’s called Unicorn Juice and now it’s by far his favorite.” Brandon’s favorite beer is also a part of this list, La Fin Du Monde, which is a 9% Belgian Tripel made in Canada that is said to be a tough find on draft around town. Keep in mind that just because High Tide is a beer and wine bar, that doesn’t mean you have to miss out on a refreshing cocktail. Three frozen cocktails are spun daily including their Frozé, their Desert Ice, which is similar to a frozen margarita, and Black Magic, a charcoal Soju-based concoction that is extra Instagram-worthy. As for their menu of small, apropos seafood dishes by Chef James Reamy of elevated burger haven Meatzilla, the deep sea influence shines through vibrant, thoughtful dishes such as the “High Tide” Seafood Salad -- which is a zesty folded plate of fresh clams, scallops, and shrimp, hard-boiled egg, and salmon roe. For a lighter snack, get a few bites of Trout Dip in while you sip your frozé, or for something on the heartier side, opt for their melt-in-your-mouth Roast Beef Sandwich. You won’t have to worry about asking for extra horsey sauce, they’ve got you covered… literally. In the near future, High Tide will feature Jazz Sundays and host curated open mic nights where you can watch some of your favorite local performers play an acoustic set while you imbibe. High Tide is open Tuesday through Sunday with extended hours on the weekend, so throw on your shades, put your game face on, and spend an hour (or 5) with something delicious in hand.